12/12/14 Welcome to the group, Justin! We extend a warm welcome to Justin Yoo, a first year Chemical Engineering student, to the O'Malley group. Justin will be co-advised with Patrick Daugherty, and will initiate a new project based on membrane protein receptor engineering. Welcome, Justin! Congrats to Nikki & Sunyia for acceptance of their invited manuscript to WIRES: Nanomedicine and Nanobiotechnology! Watch for the the article here. This year, Jessie is adding another impressive set of training to her resume by pursuing a Master of Environmental Science and Management Degree at UCSB's Bren School! Her thesis project on agricultural waste valorization was recognized by the Eco-Entrepreneurship Program for "Best Customer Discovery" this fall, which went on to be selected as the "Most Compelling Eco-Entrepreneurship Opportunity" this winter. Congrats, Jessie! 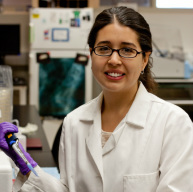 Jen Guerrero was recognized for her outstanding research presentation at the 2014 annual SACNAS meeting in Los, Angeles - congrats, Jen! Kevin, Charles, and Prof. O'Malley gave presentations at the American Institute of Chemical Engineering (AIChE) Annual Meeting in Atlanta, GA - it was great to see everyone and network with old friends & colleagues! Members of the O'Malley lab have been busy traveling this summer! We presented research from our group at the Metabolic Engineering Conference in Vancouver, BC, the SEED Conference in Manhattan Beach, CA, the UC-Bioengineering Meeting in UC-Irvine, and the fall ACS Meeting in San Francisco. Collaborative research from the O'Malley lab was featured in the Environmental Molecular Sciences Laboratory (EMSL) Newsletter, The Molecular Bond. The article discusses how collaborations with Department of Energy (DOE) research labs is enhancing research on anaerobic gut fungi in the O'Malley Lab. You can read a pdf of the article here - note that some very artistic-looking anaerobic fungi can be found on the cover! 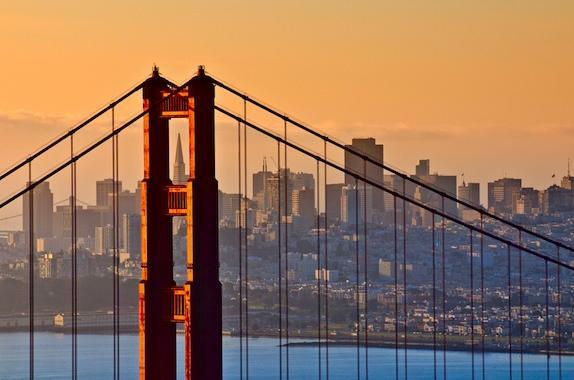 Prof. O'Malley was invited to speak in a special session at the fall American Chemical Society Meeting in San Francisco, called "Coupling Sequence to - OMICS: The Joint EMSL/JGI User Program". The session included a diverse mixture of scientists and researchers from the DOE-Joint Genomic Institute, EMSL at the Pacific Northwest National Lab, and academic researchers who are collaborating with both facilities. Prof. O'Malley was named a 2014 Hellman Fellow! The Hellman Fellows Program supports the research of promising junior faculty at 14 institutions, including all 10 UC campuses, the American Academy of Arts and Sciences, Harvard Business School, Stanford, and Williams College. 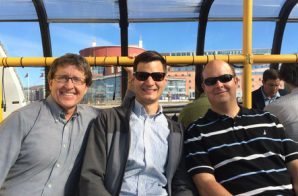 Prof. O'Malley was part of the faculty and student delegation from UCSB that traveled to Gothenburgh, Sweden for the UCSB-Chalmers Joint Workshop on Advanced Materials. Many thanks to our Chalmers hosts for a fabulous visit, and exciting conversations about joint research endeavors. We look forward to hosting you at UCSB this winter! Prof. O'Malley won the "People's Choice" Award at the first annual Shark Tank Competition at the 15th UC Bioengineering Symposium held at UC Irvine. Each UC selected an assistant professor from their campus to pitch a new idea or technology related to bioengineering. Several prominent 'sharks' from industry, academia, and medicine challenged the ideas similar to the TV show 'Shark Tank'. Prof. O'Malley's presentation was "Fueling Sustainability: Turning Marine Pests into Commodity Chemicals", which sought to breakdown invasive tunicates in the Santa Barbara Channel to value-added chemicals. Congrats to John, who passed his candidacy exam today! The California NanoSystems Institute (CNSI) awarded one of the inaugural CNSI Challenge Grants to a collaborative research team led by Prof. O'Malley. These $150,000 grants are meant to nucleate new collaborative research directions at UCSB. Our proposal, entitled "Engineering Anaerobic Consortia for Sustainable Chemical Production" will leverage complementary approaches in microbiology and analysis techniques to capture syngas from anaerobic bioreactors. The University of California Cancer Research Coordinating Committee (CRCC) selected our proposal, "A novel system to screen GPCR crosstalk during cancer proliferation" for funding. Thanks, CRCC! Charles led the charge on our recent article, entitled "Anaerobic gut fungi: advances in isolation, culture, and cellulolytic enzyme discovery for biofuel production", which was just published as an invited manuscript in Biotechnology and Bioengineering. Congrats to all involved! You can read the paper here. Prof. O'Malley presented a plenary talk highlighting her DOE Early Career Award at the DOE Genomic Science Grantee Meeting in Arlington, VA. The meeting brought together DOE BER-funded researchers from across the US to share and exchange ideas relating to their projects. Our article, entitled "Extracting data from the muck: deriving biological insight from complex microbial communities and non-model organisms with next generation sequencing" was just published in Current Opinion in Biotechnology! Congrats to Kevin and Charles, and special thanks to our Broad Collaborator, Dawn. You can access the manuscript here. The Why Files at UW-Madison highlighted the O'Malley Lab as part of their recent story on cellulosic biofuel production. You can read the article here. 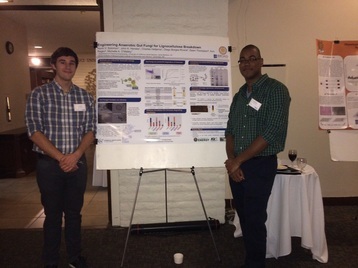 The group traveled to UC-Irvine to present at the 4th Annual Southern California Systems Biology Conference. The meeting was sponsored by the San Diego Center for Systems Biology (UCSD) and the Center for Complex Biological Systems (UCI), which brought together researchers from ten different campuses in southern California. Kevin and John presented a poster on their work with anaerobic fungi, and Prof. O'Malley gave one of the talks to represent UCSB at the meeting. The O'Malley lab was awarded a Grant-in-Aid from the Western States Affiliate of the American Heart Association (AHA). The $140,000, 2-year award will fund our group's research to gain mechanistic insight into the oligomerization of human adenosine receptors, which play a vital role in cardiac function and heart disease. 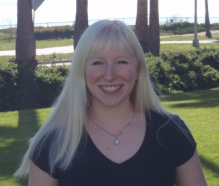 Nikki was awarded a Women Chemists Committee (WCC)-Eli Lilly Travel Award to attend the Spring American Chemical Society (ACS) meeting in Dallas. Congrats, Nikki! The O'Malley lab made the short trip up the coast to San Francisco to attend the 2013 AIChE annual meeting. Kevin, Charles, and Jen presented their research in SF, which was the highest attended AIChE meeting ever! Special congratulations to Prof. Anne Robinson (Prof. O'Malley's graduate advisor at UD), who was awarded the Women's Initiative Committee (WIC) Mentorship Excellence Award at the meeting. Our proposal was one of 8 selected as part of the new collaboration between the DOE Joint Genome Institute (DOE JGI) and the Pacific Northwest National Lab's Environmental Molecular Sciences Lab (PNNL EMSL). Our 2014 Community Science Proposal (CSP) is entitled "Identification and Regulation of Cellulases within Novel Anaerobic Gut Fungi". More info on our work and other research groups selected in the 2014 CSP can be found here. For an unprecedented second year in a row, Jen was a co-winner for the Best Student Poster at the Amgen-Clorox Graduate Symposium! Congrats Jen on a job well done!!! 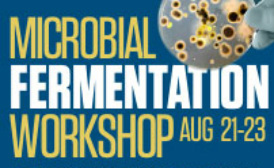 Prof. O'Malley was one of the instructors at the inaugural "Microbial Fermentation Workshop" sponsored by UC-San Diego Extension and the Center for Continuing Education in Biosciences (CCE-Bio) at UCSD. The three day course brought together professionals from industry and academia from across the US. 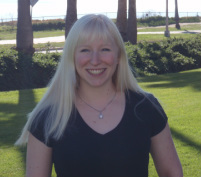 Nikki Schonenbach passed her PhD Candidacy Exam and is now officially a PhD Candidate - Congrats, Nikki! 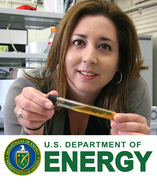 Prof. O'Malley is one of 61 early career investigators to be awarded a 2013 Early Career Award by the U.S. Department of Energy's (DOE) Office of Science. The award, funded at $750,000 over five years, will support ongoing research on biofuels. Her proposal, entitled "Engineering Anaerobic Gut Fungi for Lignocellulose Breakdown", was selected for funding by the Biological and Environmental Research (BER) Division of the Office of Science. More information about the award can be found at the links below. 4/11/13 O'Malley Lab Featured in the Los Angeles Times and Other News Outlets! Our lab's research was the focus of a recent article that appeared in the LA Times! Since then, several other news organizations have reported on our unique approach to biofuel research, including the Smithsonian, Discovery News, and the Huffingtonpost. Many thanks to the ACS for spreading the word about our work! Prof. O'Malley presented Kevin and Charles' research in the "Biofuels and Sustainable Energy" session in the ACS Division of Biotechnology (BIOT). Her talk was entitled "Transcriptomic Analysis Reveals Novel Lignocellulolytic Enzymes from Anaerobic Gut Fungi." The American Chemical Society (ACS) chose to highlight our research on anaerobic gut fungi at the 245th Annual Meeting. The meeting brought together over 15,000 academics, students, and industrial professionals in New Orleans, LA from April 7-11. The ACS prepared a press release on our research that was distributed to the media, and you can watch Prof. O'Malley's press conference here. Kevin presented a poster and Prof. O'Malley gave a talk in the Metabolic Pathway Engineering session at the 4th International Conference on Biomolecular Engineering (ICBE). The Institute for Collaborative Biotechnologies (ICB) recently funded our research focussed on synthesizing cellulose-degrading complexes from fungi. You can read more about our project and other ICB-funded research here. Jen was a co-winner for the best student poster prize at the annual UCSB Chemical Engineering Clorox-Amgen Graduate Symposium. Congrats Jen! The O'Malley Lab website is (finally) live! Please check back often to stay informed about our research.